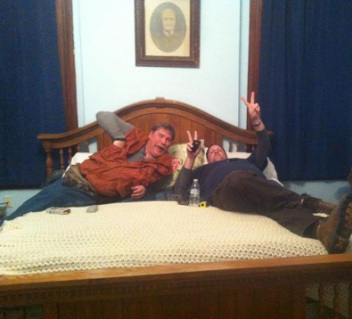 Joe and Sean in one of the upstairs bedrooms preparing for an EVP session. This specific room got really eerie as we settled in. Sedamsville rectory has been featured on several TV shows such as Ghost Adventures and The Haunted Collector. The building does have an eerie feeling to it. The residual energy in the building is "off the hook". One of the worst known priest molestation's of young boys having happened there in the '50's. According to other sources two dead bodies were found nearby. One was an infant and the other a adult man. One of the priest also died in the building and his wake was held in the downstairs parlor. Approximately a month before we did our investigation there the Ghost Adventures episode aired. During which Zack and his team brought a priest in to exorcise the building. It must have worked since none of our team fell anything demonic during the time we were there. Never the less, we did capture our share of EVP's. Not all of the spirits were "nice". In fact, most were very vulgar in the way they communicated with us while using our spirit box. Some were so bad that I can't (or shouldn't) re-post them here. Suffice to say, we didn't make any friends while we were there. We believe this is referring to the molestation scandal that rocked the parish in the "50's. For a while the rectory had dog fighting taking place in the basement. Apparently they do know they're dead. We became a little impatient and things went down hill from here. We were encouraging the spirits to go upstairs and surprise the women on our team investigating on the second floor at the time. They knew there were three of us in the basement.